CREEPY CHARLIE HAUNTED DOLL with SOUND. 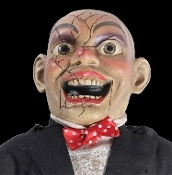 This Jolly little doll has a wicked side that you can only get to know from bringing him home with you. Give him a new home...if you dare! Charlie features sound-activated or push-activated sounds, rigid PVC plastic head and hands with a soft polyfill stuffed body and feet. Uses 2-AA batteries, Yes, INCLUDED! Approx 15-inch (37.5cm) high x 8-inch (20cm) wide x 4.5-inch (11.25cm) deep.